Location: Compton Beauchamp, Oxfordshire. Grid Reference: 51.566° N, 1.595° W.
This atmospheric Neolithic chambered long barrow lies 2km along the Ridgeway from the Uffington White Horse: it was once believed to be the habitation of the Saxon smith-god Wayland. The early date suggests that it was built before any of the other works at Uffington. Excavations have revealed several remains of bodies which are believed to have been excarnated first (Removed of their flesh and organs). Wayland's Smithy is one of the finest chambered long barrows in Britain and lies a short hike away -along the Ridgeway- from Uffington White Horse and Uffington Castle. Excavations in 1962-63 proved that it had been built in two different periods, around 3,700 and 3,400 BC. In the first period, a wooden mortuary chamber was constructed, where fourteen articulated and disarticulated bodies have been found. Then the burial chamber was surrounded by some sarsen boulders and covered with a mound of chalk taken from two flanking ditches. This first mound and its ditches are not visible now, covered by the following long barrow. In the second period the trapezoidal chalk mound that we see today was built, measuring 60m (196ft) in length and from 6 to 15m (19 to 50ft) in width. The chalk was held in place by a kerb of stones. 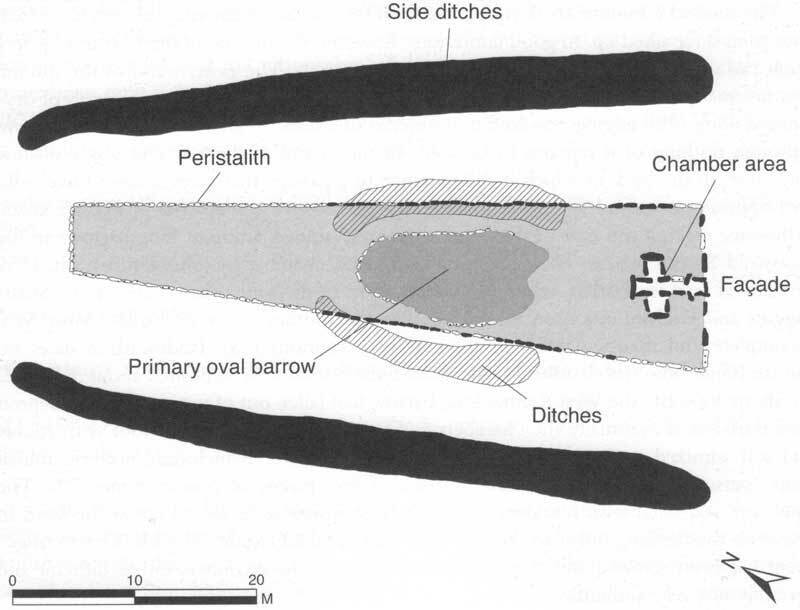 At the south end of this barrow, there were once six large slabs. Now only four survive: they are 3m (10ft) high and they flank the entrance of a cruciform tomb formed by a passage 6.6m (21ft) long with one chamber at either side. The passage is 1.8m (6ft) and the chambers 1.3m (4ft) high. In excavations in 1919, eight skeletons, one of a child, were found in the long barrow. 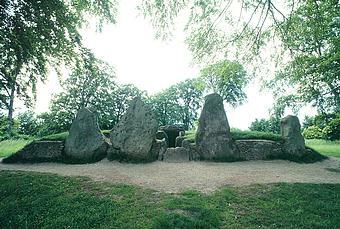 Wayland's Smithy got its name long after its construction (First recorded in a charter of King Edred dated AD 955), when Saxon settlers came across the tomb. Not knowing who had built it, they imagined it was the work of one of their gods, Wayland the Smith. Later, a legend grew that Wayland would re-shoe any passing traveller's horse left along with a silver penny beside the tomb. Another local tale says that Wayland had an apprentice called Flibbertigibbet who greatly exasperated his master. Eventually Wayland lifted the boy and hurled him as far away as he could, down into the Vale. Where Flibbertigibbet landed he remained, petrified. The stone became a boundary marker and remains to this day in a field called Snivelling Corner by Odstone Farm. Waylands Smithy: Gallery of Images. Late 19th Century image from before reconstruction. 1). T. Eric Peet. Rough Stone Monuments and their Builders. 1912. Harper and Bros.